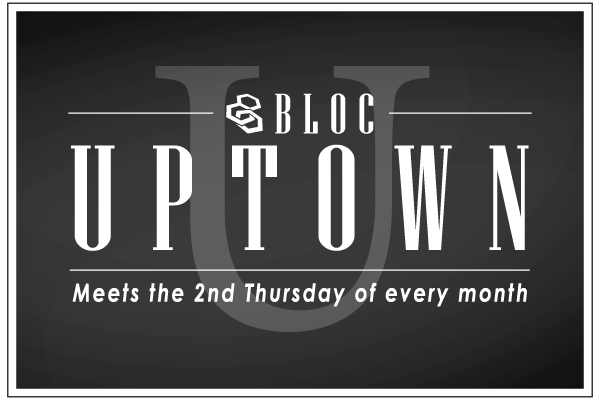 BLOC-Uptown meets the 2nd Thursday of each month at at Dresslers in The Metropolitan, located at the corner of Kings Dr. and Charlottetown Ave.
Start time is 11:45am, but members arrive early for networking purposes and we will wrap up at 1:00pm promptly. This is a meeting for the MEMBERSHIP and their guests only. This gathering occurs once a month and is a great opportunity for BLOC-Uptown members to catch up with one another. Our luncheon is located in the Private dining area of Dresslers just for our group. Once you come in the front door, please walk around the bar to the back dining area and then proceed down the back hallway to the private dining room. Please arrive by 11:45 AM to Network. We begin promptly at 12 Noon and end by 1:00 PM. We will begin the meeting promptly at noon and discuss BLOC, BLOC Business, Upcoming BLOC Events and have an opportunity to discuss each of our businesses with the group. Our lunch will be a choice of a grilled chicken salad or a rotating entree item, which will cost $20. We begin having members make their selections upon arrival, so if you plan to eat, please put your order in and drop your Credit/Debit card in the glass pitcher on the sign in table and they will run the cards while we have our meeting. At the end of the meeting, your card will be available to pick up and sign. Please don't forget to grab your card before you leave! Looking forward to seeing you at DRESSLERS!